CB2 is located at 5-7 Norfolk Street, Cambridge, CB1 2LD, just off East Road, a short walk from the Grafton Centre car park, Drummer Street Bus Station and the City Centre. There is a detailed map of the location at the bottom of the page. 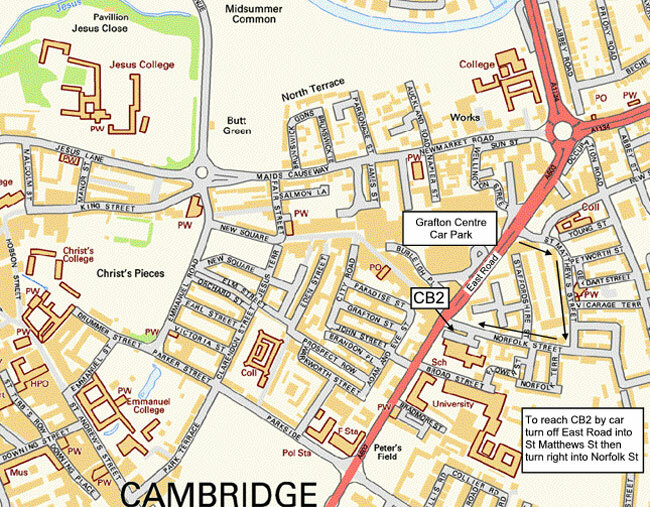 For other maps of the area go to multimap, for information about Cambridge go to camcity. For a print version of this map in PDF format CLICK HERE. The public entrance to CB2 is on Norfolk Street but performers can bring cars to the rear for easy unloading at the stage door. The map below gives directions for cars from East Road.